Everything you need to know about making costumes for plays, pageants, musicals...at minimum expense. - Publisher This wonderfully practical book literally shows you how to make costumes for plays, pageants and musicals at the lowest possible expense! Over 150 detailed illustrations work with the easy-to-follow text to walk you through every step of the process. Just about every basic period is covered: Biblical to Medieval, Renaissance, Angels, The Fabulous Fifties, 1800s to World War I, The Roaring Twenties and more. Many helpful hints on making or buying realistic period theatrical costumes on a shoestring budget from cast-offs, donations, scraps and other easily-obtained materials. Also included are "special effects" costumes, helpful hints for getting into and out of costumes, and a glossary of costuming terms. A book that will pay for itself with its first use. Contents: Resources: Where Do I Start?, Period Costumes, Who Was That Masked Man?, Undemeath it All, Helpful Hints and Useful Information, The Play's the Thing, Epilogue: Behind the Scenes, Glossary. 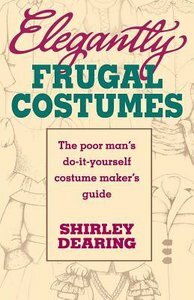 This wonderfully practical book literally shows you how to make costumes for plays, pageants and musicals at the lowest possible expense! Over 150 detailed illustrations work with the easy-to-follow text to walk you through every step of the process. Just about every basic period is covered: Biblical to Medieval, Renaissance, Angels, The Fabulous Fifties, 1800s to World War I, The Roaring Twenties and more. Many helpful hints on making or buying realistic period theatrical costumes on a shoestring budget from cast-offs, donations, scraps and other easily-obtained materials. Also included are "special effects" costumes, helpful hints for getting into and out of costumes, and a glossary of costuming terms. A book that will pay for itself with its first use. Contents: Resources: Where Do I Start?, Period Costumes, Who Was That Masked Man?, Undemeath it All, Helpful Hints and Useful Information, The Play's the Thing, Epilogue: Behind the Scenes, Glossary. Shirley Dearing is a Meriwether Publishing author.